Labradoodles first came to public attention around 1988. With famous celebrity owners like Tiger Woods drawing even more attention to this cross-breed, they are sure to continue growing in popularity. Labradoodles are just one of a number of cross-bred dog types that fall under the recently coined category of "designer dogs." These good natured pets are the result of breedings between Labrador Retrievers and Standard Poodles. 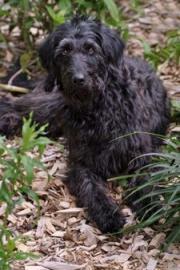 The original Labradoodle traces its beginnings to Australia, where Wally Cochran of Royal Guide Dogs carried out the first deliberate cross-breedings in an effort to create a hypo-allergenic dog breed that could be used as service dogs. Cochran had allergy testing performed on saliva and dander samples from all resulting offspring of these first matings, and pursued his breeding program using only dogs that were proven to have less allergenic tendencies. Within a few generations, he had established a line of dogs that, although not purely hypo-allergenic, still caused far fewer reactions in dog allergy sufferers. Of course, once this breeding program became public knowledge, many individuals hoping to cash in on the hypo-allergic bandwagon began indiscriminately breeding Poodles and Labs together calling the resulting pups "Labradoodles," a term Wally Cochran himself had originated. 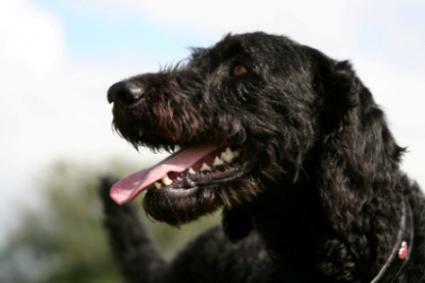 As a result of this market flood, most Labradoodles today are not likely to be truly hypo-allergenic. As yet, there is very little uniformity in the appearance of these dogs. Some look quite a bit like their Poodle ancestors, while others more closely resemble shaggy Labs. "Doodles," as they are affectionately called by their fans, are available in a range of sizes. Standards can range between 50 and 75 pounds, with females at the lower end of the scale and males at the higher end. Mediums fall in the 40 to 50 pound range. Miniatures range from 25 to 45 pounds. Currently, there are two main coat types for Doodles. Wool curly coats are similar to the traditional poodle coat texture. Fleece coats have a softer texture than wool coats, and hang in loose curls. Although the hypo-allergenic quality of these dogs remains questionable, there is no room for doubt about their wonderful personalities. The ideal Labradoodle is a highly social creature, affectionate and loyal by nature, and very tuned in to its human companions. It also tends to get along well with other canine companions, being less territorial than some breeds. Doodle training has also proven to be a success. These dogs easily learn what is required of them for daily family life. Plus, they have also made their mark in the service dog arena becoming guide dogs for the blind and terrific therapy dogs. It's difficult to predict what the future may hold for this aspiring dog breed. Will quick cash breeding give way to a renewed effort to establish a truly hypo-allergenic pet or will Labradoodles turn out to be a canine fad? The answers to these questions remain in the hands of Labradoodle breeders everywhere.